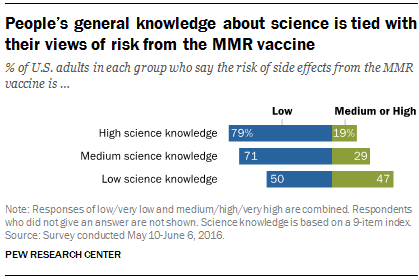 They stand apart from the 73% of Americans who see the MMR vaccine as a benefit, the 66% who say there is a low risk of side effects and the 88% who say the benefits of the vaccine outweigh the risks, according to a new Pew Research Center survey. Further, some 82% of Americans support requiring children attending public school to be vaccinated for measles, mumps and rubella because of the potential health risk to others. By contrast, 17% of Americans say parents should be able to decide not to vaccinate and 10% believe the risks outweigh the benefits. Public health officials place particular importance on the views of parents who must decide whether or not to follow the recommended schedule to immunize their children for measles, mumps and rubella starting when their children are between 12 and 15 months old. 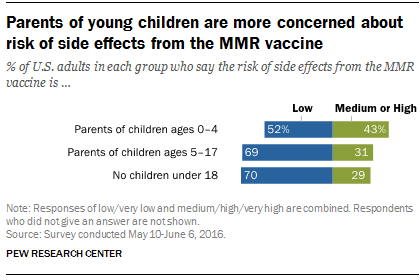 The new survey finds that parents with children ages 4 or younger are more concerned than other Americans about the potential risk of side effects from the MMR vaccine. About half (52%) of parents with children ages 0 to 4 say the risk of side effects is low, while 43% say it is medium or high. By contrast, seven-in-ten adults with no minor-age children (70%) rate the risk of side effects from the vaccine as low. On average, parents of young children tend to be younger than the general population. There are some differences in views about vaccines by generation. Adults younger than 30 are less inclined than older age groups to think the benefits of the MMR vaccine outweigh the risks (79% compared with at least 90% of those in older age groups). These age differences are broadly consistent with past Pew Research Center surveys that looked at more general support for requiring childhood vaccines and perceptions of vaccine safety. Views about the MMR vaccine also differ by race and ethnicity. 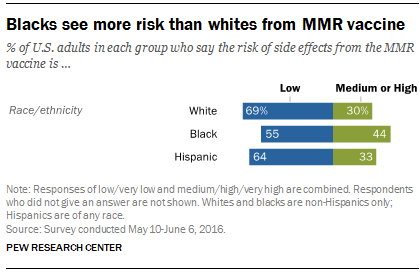 For example, blacks (44%) are more likely than whites (30%) to say the risk of side effects from the MMR vaccine is either medium or high. Some 56% of blacks rate the preventive health benefits of the MMR vaccine as high, compared with 79% of whites. People’s practices in connection with conventional and alternative medicine also tend to align with their views about the MMR vaccine. For example, 8% of Americans report that they never take over-the-counter medications for cold or flu symptoms. This subgroup is closely divided over whether the risk of side effects from the MMR vaccine is low (50%) or at least medium (49%). More generally, people who report trying alternative medicine instead of conventional medicine see more risk from the MMR vaccine. Alternative medicine is a broad category that includes herbal dietary supplements, acupuncture, chiropractic, energy therapies and others that are not part of what is often called conventional or standard medical care. Some 43% of Americans who have used alternative medicine instead of conventional treatment say the risk of side effects from the MMR vaccine is medium or high. 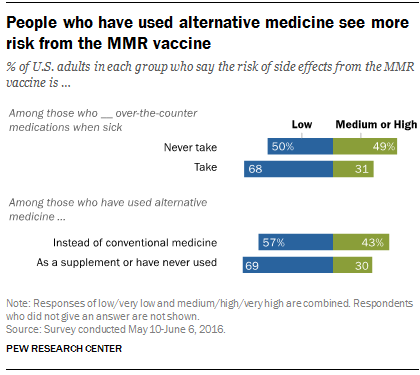 By comparison, 30% of those who report never using alternative medicine or using it in conjunction with conventional medicine say the risk of side effects from the vaccine is medium or high.